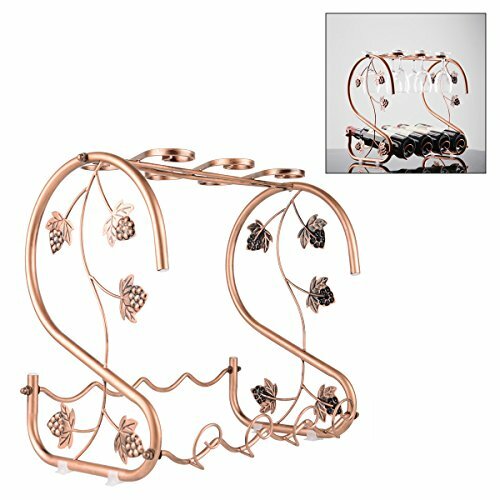 The dual use wine glass and bottle rack is a new addition to the furniture market and it is indeed special.The wine rack is wrought iron, making it more durable and practical and smooth and is easy for cleaning.With some hooks on its top and bottom separately, it can hold 6 wine cups and 4 wine bottles, good for quick accessing to these items. It is a decoration to your home. It is easy for you to transport it due to its lightweight. Away from this, it is suitable for different occasions, such as bar,party,graduation ceremony.The wine glass and bottle organizer will bring you a comfortable experience. Classical Style and Elegant: A great decoration for your home and party. Easy Assembly: You can dismantle the item following the instruction and assemble it quickly. Nice for placing into your cabinet when not in use. All Metal Construction and Pretty Antique Brass: It looks shiny and ensures the long-lasting Service life. Offer Protection: Anti-scratch pads included in this item prevent product's surface damage. [Nice Appearance and Unique Design] (1) Made of metal with the antique brass finish, the wine glass stemware storage display rack is particularly designed with European style, looking so special and bringing some classic style to your home. (2) Grapevine patterns adds idyllic atmosphere to the wine rack. [Convenience to Use] (1) Fine curled-metal hooks on its top and bottom, ideal for holding six wine glasses and four wine bottles respectively to avoid sliding and breaking and then take advantage of spaces. (2) With non-slip pads installed on its bottom, it not only keeps the wine rack upright and firmly balanced but also avoids scratching the tabletop. (3) Easy for assembling and disassembling with the spanner, allowing you to place the cabinet for storage. [Multiple Purpose] (1) Perfect for kitchen, dinning room, wine bar, restaurant, countertop. (2) Ideal for various associations, such as party, family¡¯s and friend¡¯s gatherings, business meeting, wedding ceremony. (3) A great gift for Birthday, Christmas, Father¡¯s day, Thanksgiving¡¯s day. [Approximate Size] (1) 40x37.5x23(cm)/15.7x14.7x9(inches). (2) Note: Wine glass is not included and please refer to the size before selecting. [100% Money Back Guarantee] This wine glasses rack is with 100% satisfaction guarantee service. If you do not like this product, please do not hesitate to return to receive your full payment back. If you have any questions about this product by OKOMATCH, contact us by completing and submitting the form below. If you are looking for a specif part number, please include it with your message.